I ordered one of Magnoli's original journals back in 2008 and remember being floored by the design. I gave that journal to my father. Many years later, searching for one to use for myself, I came back to Magnoli Clothiers searching for the Diary once more. 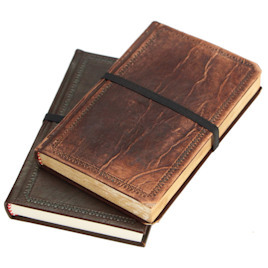 I placed an order for the Dark Brown Aged Professor's Diary. When it arrived a week later, it just was not the journal I had purchased in 08. After speaking with Indy (Magnoli), he exchanged the journal for an Aged Tan Professor's Diary, taking the time and care to deliver one slightly adjusted to what I was looking for from the aging/embroidery process. It arrived today and all I can say is WOW. EXCELLENT craftsmanship, and EXCELLENT form. I could not be happier with the journal or more thankful to Magnoli for his patience and understanding throughout the exchange process. All in all, a FLAWLESS product that I am GREATLY looking forward to taking with me on my travels. Thanks again, Indy.